Byrrh, a fortified wine once unavailable in the U.S., shines in the Marianne cocktail, a riff on our cherished Manhattan. Several years ago, while pouring through Vincent Gasnier’s Drinks, a gorgeously photographed and curated tome of alcoholic beverages throughout the world, Paul stumbled upon a minuscule entry for a fortified wine called Byrrh. Byrrh is produced in Roussillion, in the far south of France. It is red wine treated with quinine . . . and herbs. The mixture is matured for three years before bottling. You will either love or hate this distinctive apéritif—its combination of sweet flavors and bitter finish is unique. Serve it either at room temperature or slightly chilled. So many things in these two succinct paragraphs intrigue: “matured for three years,” “love or hate,” “unique.” Also, the name itself. Byrrh looks like the word myrrh (frankincense and gold’s biblical sibling), so Paul decides, in rhyming solidarity, to pronounce it brrr, as if shivering from a chill in the air. After doing a little sleuthing, he discovers that Byrrh (actually pronounced beer—how’s that for confusion!) is unavailable in the U.S. Like a child confronted with the unobtainable, he is stung by the bee of acquisitiveness and that bee will remain buzzing around his bonnet for the next six years until Byrrh finds its way to these shores (thanks to Pernod Ricard). 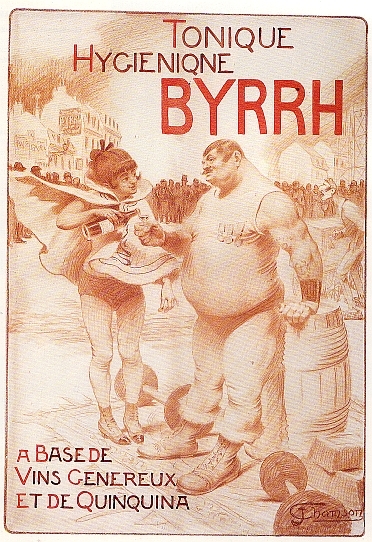 Byrrh is categorized as an amère (bitter), specifically a quinquina, a fortified wine that contains the herb quinine, which was added to wines as an effective malaria prevention. 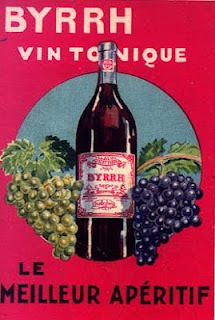 Invented in 1866 in the Eastern Pyrénées, Byrrh’s popularity grew steadily after poster competitions were launched in 1903 to promote the brand, and were continued throughout the early part of that century. 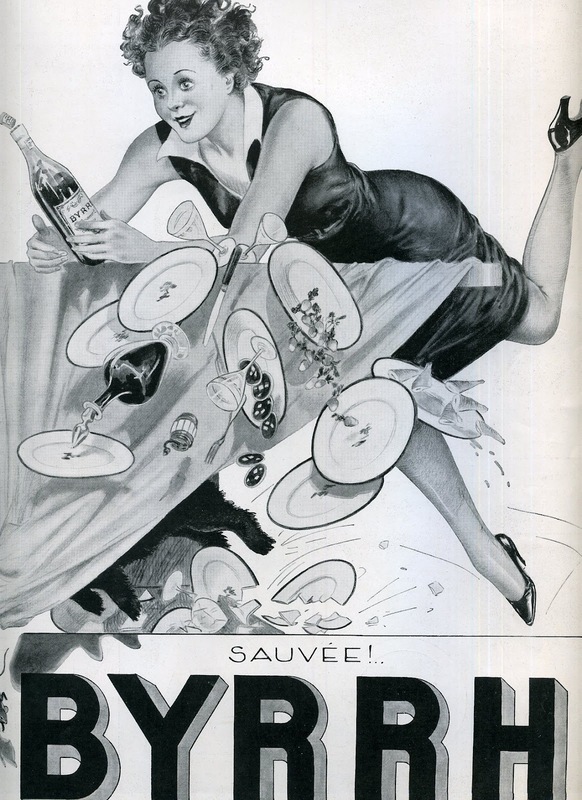 By 1935, Byrrh achieved the position as the number one apéritif in France. Scouring old cocktail books can be an entertaining but often frustrating endeavor if a spirit is unavailable. Take for instance David A. Embury’s The Fine Art of Mixing Drinks. Ever since Mud Puddle Books republished it, we had been meaning to get a copy, so when we finally did, we looked through the Manhattan section only to rediscover the Marianne cocktail. But this time, we were in luck. The bee that was busily buzzing in Paul’s bonnet would be laid to rest; Byrrh was being sold at Astor Wines & Spirits. We’ve played with several spirits brands in making the Marianne cocktail, and find that following the recipe below will make you look at the Manhattan in an entirely new light. Akin to what we now would call a Perfect Manhattan (Embury called it a Medium Manhattan), the Marianne cocktail replaces sweet vermouth with Byrrh. But before you make the cocktail, you should take a sip of this enticing quinquina. It’s sweeter than most vermouths because it contains mistelle, a syrup made from mixing neutral spirits with partially fermented grape must. You can taste the lusciousness of the fruit. Enjoy. Stir in ice for 30 seconds. Strain into chilled cocktail glass or coupe. 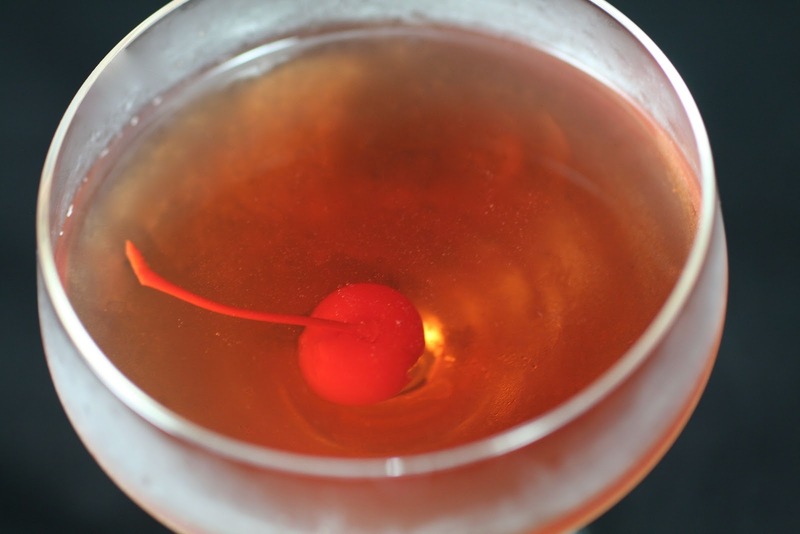 Garnish with a maraschino or brandied cherry. 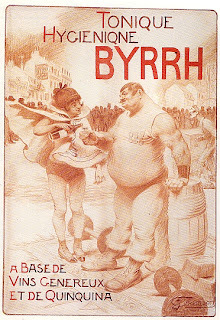 If you like the taste of Byrrh, you may love the Rye Byrrh, which reverses the potency of the spirits in the Marianne. It’s lighter, and on the rocks. Perfect for a casual cocktail party. Serve with bacon-wrapped dates. Stir in ice for 15 seconds and strain into ice-filled rocks glass. Express twist over glass and toss in. Hemingway loved it, as well he should have. Imbibing this Cuban work of art can be a religious experience. 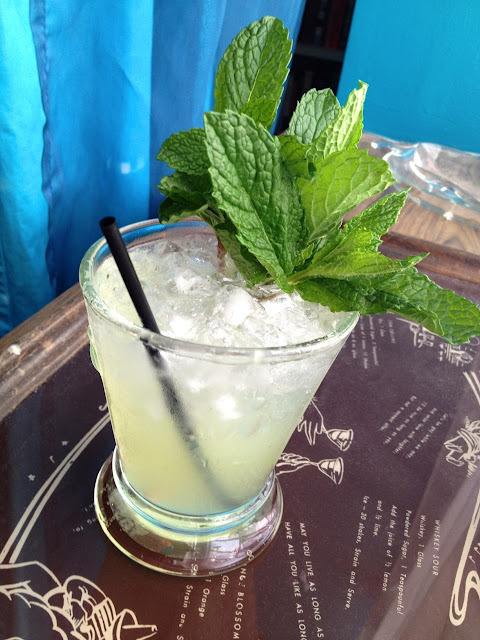 If ever there was a drink that defined the first decade of the new millennium, hands down it would be the Mojito [pronounced moe-HEE-toe, but you probably already knew that]. Easily recognizable by its limey and minty redolence, the Mojito seemed to pounce on the bar scene in the early aughts as the tropical replacement to the 90’s très façonnable Cosmopolitan. A sigh of relief, really. It seemed time for the vodka-based Cosmo to lose its crown: by the end of the 90’s it had been bastardized to the point where some bartenders were just pouring unmeasured ingredients or prebatched concoctions into an ice-filled glass just to keep the cash register burping contentedly. The Mojito was a welcomed pinch hitter. Light rum, which had always been popular, was due for a resurgence in well-made drinks for the thirsty crowd. Fresh ingredients were a must. But as the decade dragged on, bartenders arms grew weary from muddling, and bar managers saw how long it took to make one. Those life-changing Mojitos you used to imbibe at reputable drinking establishments morphed into sugar-bomb low-rent sludge-fests. We all remember being bewitched by our first, superbly crafted Mojito. It’s high time to return to those flavors, guaranteed by proper muddling with fresh ingredients. Because we love Mojitos, we’ve been playing around with ratios of ingredients and interpretations of methods for several years. As a result, we never published a recipe. We knew it was the right time to do so when our friend Matt Schepis texted in disbelief. “I looked on your Recipe Index for a Mojito and it wasn’t there.” Sorry, Schepis. We assured him not to worry. 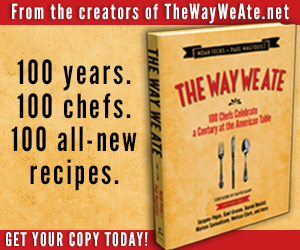 The recipe was on its way. When we make Mojitos with our friends Theo and Curt, we always seem to talk about how widely varying Mojitos can be from bar to bar, party to party, and Theo decries this wide gap that separates a great Mojito—the one that changed your life—from a horrible one. We assured him that ours would be the one to bring back good memories. Cut lime into wedges. Add mint leaves to shaker, followed by lime wedges, then sugar. Muddle until all the juice is released from the lime, which will dissolve the sugar. Add rum and ice. Shake for 15 seconds and strain into ice-filed highball glass. Top with soda. Garnish with lots of mint sprigs. * On an exceptionally warm day, if you’re outdoors, you may wish to eschew crushed ice and use cubed ice. Dilution will be slower. 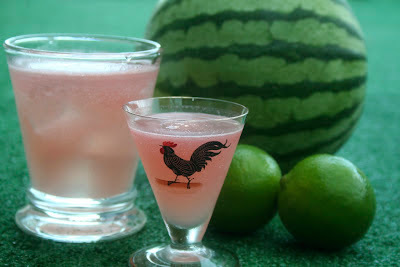 Watermelon juice is the center of attention in the Catdaddy and London Dry gin cooler, Daddy Gives Rosie a Buzz. Our friend Rosie 151, that incomparable burlesque enchantress, asked us to make her a Catdaddy Spiced Moonshine summer drink for when she performs at The Way Station in Brooklyn (the first Thursday night of every month at 10:00 sharp). We love watching her croon her way through double entendre–laden standards, with the dixieland jazz band the Red Hook Ramblers. Together, they create a French Quarter speakeasy vibe that fits snugly into the steampunk atmosphere of this Washington Avenue joint. But we had a task in front of us: Rosie wanted something summer-seasonal and fruity. With half a juicy watermelon in one hand and a fit of desperate creative energy in the other, Paul came up with a quick and utterly tasty cooler that’ll make you wish watermelon were in season year round. It’s called Daddy Gives Rosie a Buzz (or DGRB for those who prefer acronyms). Daddy Paul gives Rosie a hug. To make a DGRB, you need watermelon juice, which is quite easy to make. Just cut up your melon into chucks that’ll fit into a handheld lemon juicer, and squeeze into a measuring cup. That’s it. [SEE Method BELOW FOR ALTERNATIVES.] Pairing the juice with Catdaddy works miracles because it goes so well with the cinnamon and vanilla in the moonshine. But to make the drink more complex, Paul added some lime juice to give it a little pucker, and after that, the herbal complexities of a London dry gin to balance the sweet and tart. You can serve Daddy Gives Rosie a Buzz up, but for the dog days of summer, we enjoy topping it with a little fizz, especially Perrier sparkling water from its 250ml cans. (No more wasting an entire liter of bubbles when you only need a splash.) If you can’t make it to Brooklyn to taste the nicely spiced and fruity effervescence of a DGRB, and gaze at its bubbling blushing rosy hue, make one for yourself at home, or for friends who want to hang out with you. Pasties are optional. Shake all ingredients except sparkling water in ice for 15 seconds. If you want it up, strain (or double-strain if you want a smoother drink) into a coupe or cocktail glass. If you want it fizzy, strain into a highball glass filled with ice. Top with sparkling water. Garnish with a lime wedge, if you so desire. * To make watermelon juice, cut a watermelon into chunks (smaller than your fist) that will fit into a hand-squeezed citrus juicer. Squeeze juice into a glass and measure, pouring into a highball glass, or better yet, squeeze directly into a measuring cup. 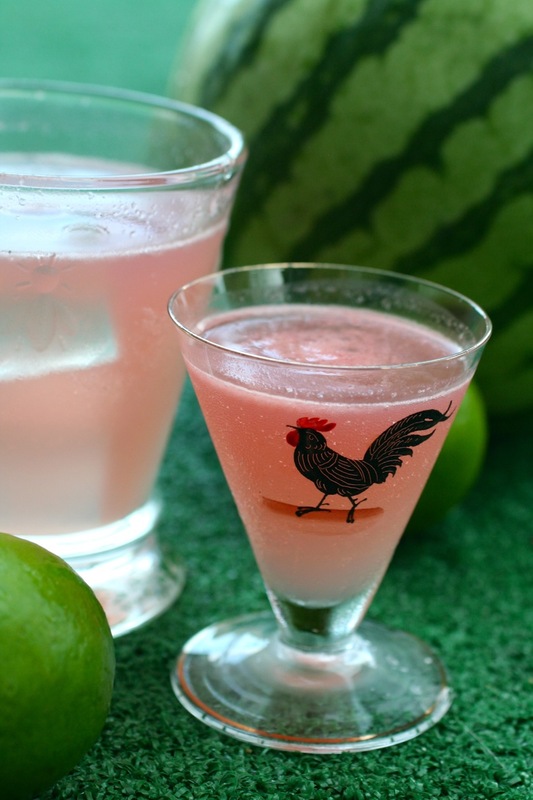 If you don’t have said squeezer, you can mash up the watermelon chunk(s) in a glass using a muddler, then strain. Alternatively, if you have a blender, you can blend the chunks, then strain. ** You can substitute club soda. Laura Baddish at The Baddish Group for providing cans of Perrier sparkling water, and Piedmont Distillers for the Catdaddy.